In today's warrior-dragging (get it?) installment of Speak Up on Kotaku, commenter Paradox Me ponders the poor treatment Square Enix has given Enix's major contribution to the role-playing world. Why does it feel like Square isn't utilizing the Dragon Quest franchise as well as they could be, despite its immense popularity? Don't get me wrong, the DS remakes of IV, V and VI are wonderful and although I haven't gotten around to playing it, IX looks great as well. Heck, I'm even excited for Dragon Quest X, despite being an MMO (a genre I swore off after over five years of Final Fantasy XI). Still, it seems like they could be doing more with it. Final Fantasy was on its tenth installment a decade ago and has gotten some pretty high profile spin-offs over the years, even spawning one of Square's flagship franchises in Kingdom Hearts. As nice as Dragon Quest Monsters and Slime MoriMori are, they don't quite compare. I just hope they're at least in the planning stages for a single player Dragon Quest XI on home consoles, akin to Dragon Quest VIII. 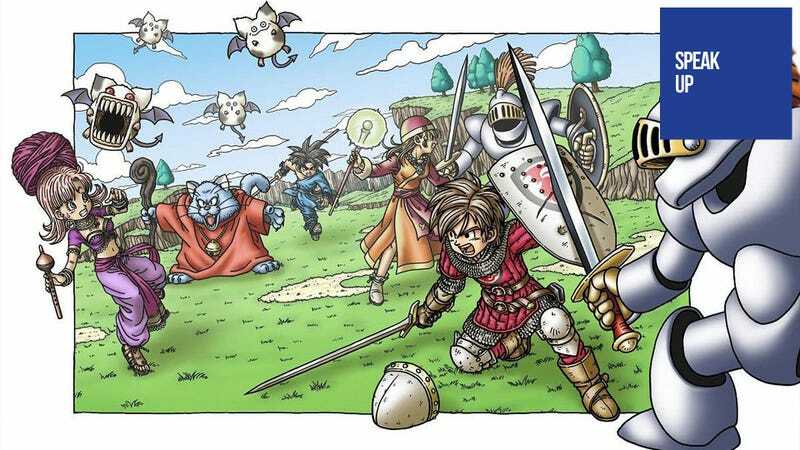 I may not like it nearly as much as Final Fantasy, but I want more Dragon Quest darn it!